Two of James Tissot’s most fascinating oil paintings are in public collections in California, and another is on loan with an exhibition in Colorado through February, 2014. 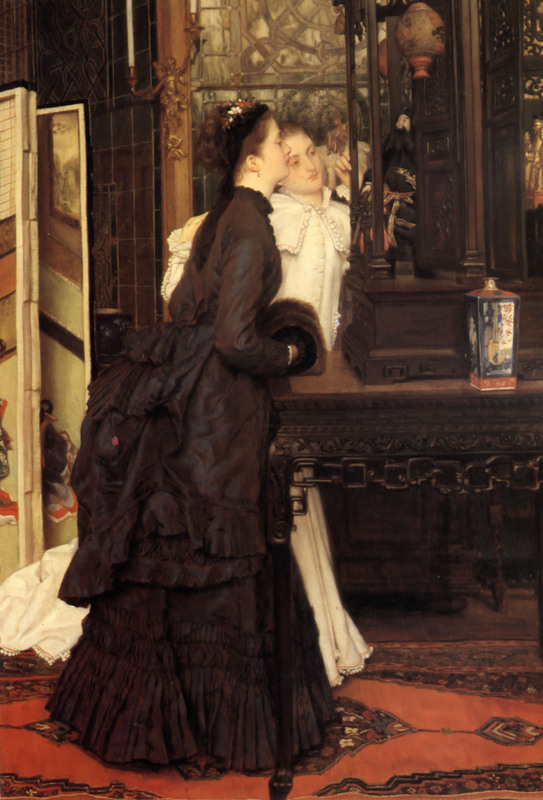 You’ll find Tissot’s Self-Portrait (c. 1865) at The California Palace of the Legion of Honour, San Francisco. Acquired as part of the Mildred Anna Williams Collection in 1961, this self-portrait shows him at 29, ready for – though perhaps wary of – the spectacular success he would earn in Paris during the five years before the Franco-Prussian War broke out. Self portrait, c.1865, by James Tissot. Oil on panel, 19 5/8 by 11 7/8 in. (49.8 by 30.2 cm). Fine Arts Museums of San Francisco, CA, USA. 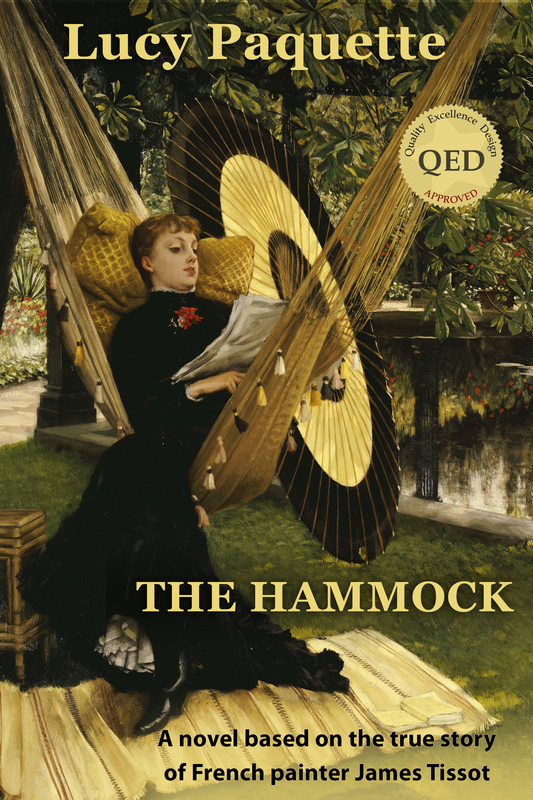 Courtesy of The Bridgeman Art Library for use in “The Hammock: A novel based on the true story of French painter James Tissot” by Lucy Paquette, © 2012. Tissot moved to Paris from the seaport of Nantes in 1856 (before he turned 20 on October 15 of that year), to study art. He lived in rented rooms in the crowded Latin Quarter and made his début at the Salon in 1859. By 1865, Tissot was earning 70,000 francs a year, and in 1866 he bought property to build himself a mansion in the avenue de l’Impératrice (Empress Avenue, now avenue Foch), Baron Haussmann’s magnificent new boulevard linking the Place de l’Etoile and the park grounds at the Bois de Boulogne. He furnished it in lavish Second Empire taste, forming a collection of Chinese and Japanese art for which he became renowned, and which he featured in many of his paintings. 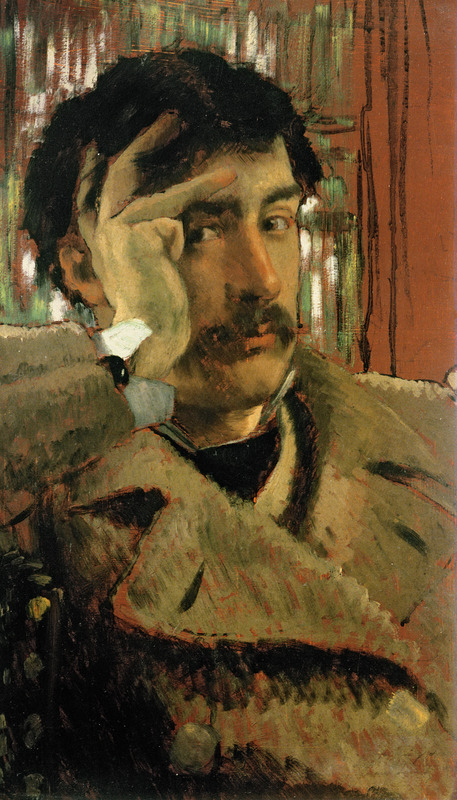 Tissot, in contrast to his friends Degas, Whistler and Manet, had found acceptance in a circle beyond the Salon, the critics, or intellectual rebels: he had found an entrée to the French aristocracy and was commissioned to paint The Marquis and the Marquise de Miramon and their children [René de Cassagne de Beaufort, marquis de Miramon (1835-1882), his wife, née Thérèse Feuillant (1836-1912), and their first two children, Geneviève and Léon on the terrace of the château de Paulhac in Auvergne]. Tissot depicted them outdoors, as an informal, affectionate family, in 1865. This painting, now at the Musée d’Orsay, served as his calling card to the lucrative market for Society portraiture. Portrait of the Marquise de Miramon, née, Thérèse Feuillant (1866), by James Tissot. Oil on canvas, unframed: 128.3 by 77.2 cm. (50 1/2 by 30 3/8 in.). The J. Paul Getty Museum, Los Angeles. Digital image courtesy of the Getty’s Open Content Program. By 1866, Tissot’s oil portraits included dapper, upper-class gentlemen, attractive and well-dressed ladies of leisure, and a wealthy-looking boy of 12 or so wearing knee breeches and red and white diced Scottish hose. Most stunning was his Portrait of the Marquise de Miramon, née, Thérèse Feuillant (1866), in her husband’s castle, the château de Paulhac in Auvergne. 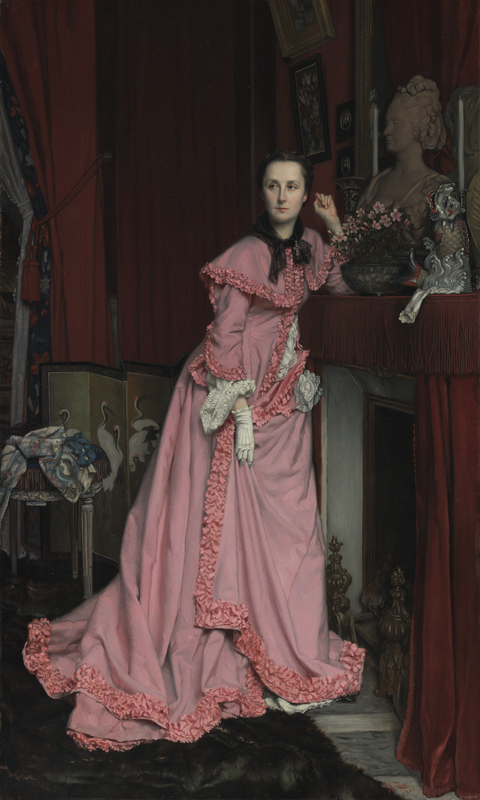 Tissot depicts the 30-year-old Marquise wearing a pink velvet peignoir, leaning on the mantel in her sitting room with a stylish Japanese screen behind her. The portrait is on display at the J. Paul Getty Museum, in Los Angeles, California, which acquired the picture from the family in 2007. Alongside is displayed a sample of the pink silk velvet used in the Marquise’s peignoir, produced with a modern aniline dye. Her descendants kept this piece of fabric, as well as the letter that Tissot wrote to her husband, who had commissioned the portrait, asking permission to display it at the 1867 Paris International Exhibition. Permission was granted, and this private image was seen by the public for the first time – the only time, until the Getty purchased it. I saw this painting when it was on display at the Metropolitan Museum of Art with the blockbuster exhibition, “Impressionism, Fashion, and Modernity.” It’s gorgeous – the photograph doesn’t do it justice. Another of Tissot’s most lovely paintings, Young Ladies Admiring Japanese Objects (1869), has been on loan to the Getty Museum from a private collection since about 2012. At the end of the Franco-Prussian War and its bloody aftermath, the Paris Commune, Tissot fled to London, where he quickly rebuilt his successful career. 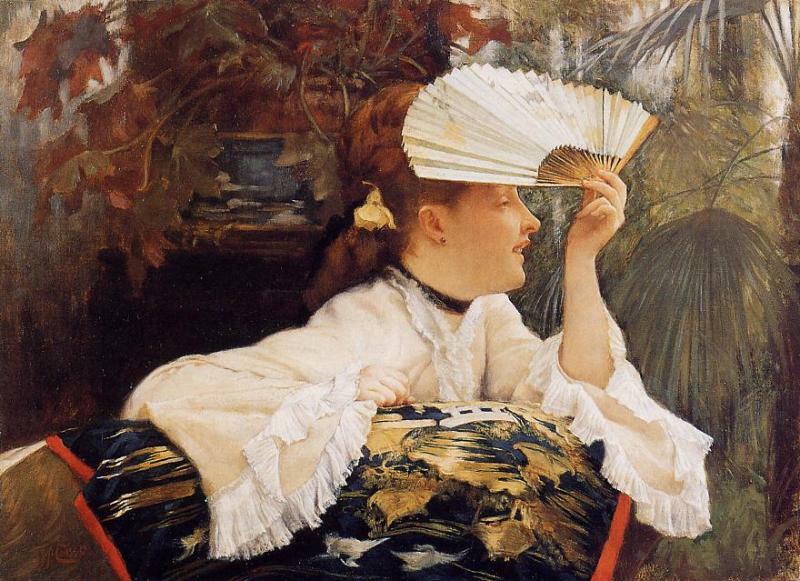 The Fan (1875) simultaneously demonstrates Tissot’s facility depicting plant life, fashion, female beauty and japonisme. It was sold at Sotheby’s, London in 1982 for $ 73,974/£ 42,000 to Charles Jerdein (1916 – 1999), a thoroughbred trainer who later concentrated on his business as an art dealer in London. Jerdein sold The Fan to the Wadsworth Atheneum Museum of Art in Hartford, Connecticut shortly after he purchased it; the Wadsworth was able to acquire it due to the generosity of The Ella Gallup Sumner and Mary Catlin Sumner Collection Fund. The Fan will be on display at the Denver Art Museum’s exhibition, “Court to Café: Three Centuries of French Masterworks from the Wadsworth Atheneum,” in the Hamilton Building, Level 2, through February 9, 2014. The exhibition will include furnishings from the Denver Art Museum’s collection and costumes on loan from the Los Angeles County Museum of Art. 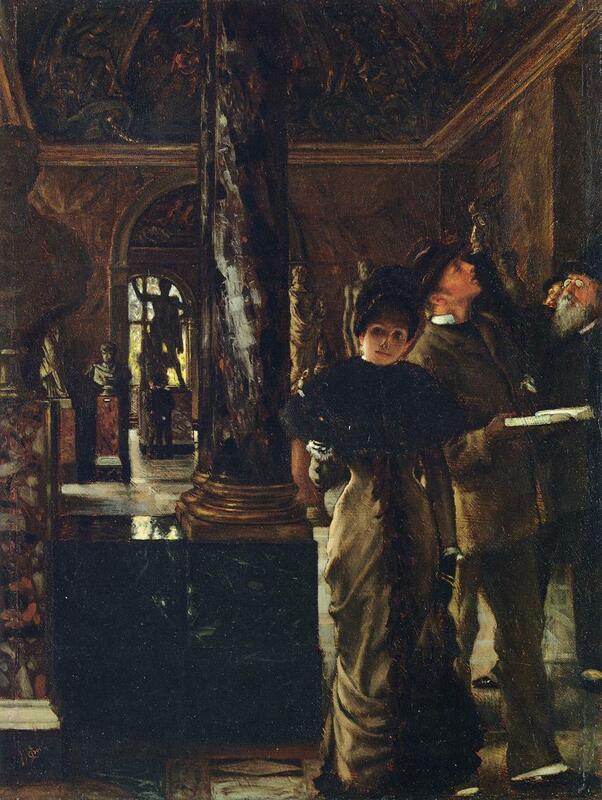 The most recent Tissot oil to enter a collection in the western U.S. is Foreign Visitors at the Louvre (c. 1880, oil on canvas, 29 by 19.5 in.). Made after Tissot’s 1879 visit to the Louvre in Paris with Kathleen Newton, the 25-year-old divorcée and mother who became his mistress and muse in London, it was donated to the Santa Barbara Museum of Art in California by the estate of Barbara Darlington Dupee in 2013. This entry was posted in Art blog, Art History, Impressionists and tagged Charles Jerdein, James Tissot, Kathleen Newton, Marquis de Miramon, Marquise de Miramon on October 30, 2013 by Lucy Paquette, author of The Hammock: A novel based on the true story of French painter James Tissot.